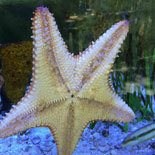 All of the animals in the Touch Tank are harmless and guests are encouraged to pick up and meet the animals. During the daily tours, the Key West Aquarium's collection of sharks, rays and turtles are fed, as guides explain the habits and habitats of these mysterious creatures. Daring guests can even pet a live shark! Tours offered every half hours throughout the day. 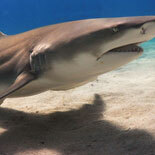 (See below for tour types) Shark feedings occur daily at 11am, 1pm, 3pm, and 4:30pm. Visit our Web Cams and experience the magic of the Key West Aquarium from you own computer! The Key West Aquarium is committed to helping protect the endangered sea turtles. The Aquarium is associated with the Turtle Hospital and Florida Sea Turtle Stranding Network comprised of state agencies, universities and marine parks, all working in the nursing and rehabilitation of injured sea turtles. The Aquarium is currently home to several turtles on the mend and some, that due to their injuries, will be permanently housed at the Key West Aquarium. Shark Interactive Feeding: Guests will have the opportunity to get up and close to one of man’s most feared apex predator- the shark. Guides will explain the importance of sharks to our waters while allowing guests to feed and touch a live shark! 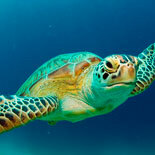 Sea Turtle Conservation Tour: Tour Guides will discuss the Aquarium’s role in the conservation efforts of these species. Daring guests can even pet a live shark! 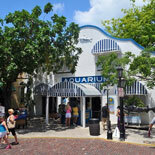 Discover the undersea world at the Key West Aquarium. 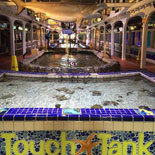 All of the animals in the Touch Tank are harmless and guests are encouraged to pick up and meet the animals. The Key West Aquarium is committed to helping protect the endangered sea turtles. Daily. 10 am to 6 pm - 365 days a year. Tours offered every half hour starting at 10:00am through 5:00pm. Children prices are ages 4-12 yrs. of age. Children 3 yrs. and younger are free. Shark Feeding: 11am, 1pm, 3pm & 4:30pm. Tours offered throughout the day from 10:00am to 5:00pm. Tour length is 20 minutes. For more information call: 305-296-2051.